Uncompensated because, even though the Trinity atomic bomb was detonated in New Mexico, and for no reason that anyone has yet ascertained, the people of New Mexico dosed by the fallout have never been acknowledged or officially recognized by the federal government as downwinders. They have never been compensated and, certainly, they have never received an apology from the US government. Hot Property…in More Ways than One. redevelopment since the 1906 earthquake. pricing all but the rich out of its new housing market. The city’s poorest quarter, Bayview-Hunters Point in its southeast corner, is the latest epicenter of development mania. But, there is a big problem. The Hunters Point Naval Shipyard hosted nuclear weapons work, including supposed decontamination of Navy ships used in Pacific hydrogen bomb tests–which left the shipyard with ultra-high radioactivity. It has been an EPA Superfund site since 1989. • Most every Tetra Tech radiation survey on the shipyard’s buildings is bogus. One of the things that makes these findings so remarkable is that the Navy was on notice for years that it had a major data meltdown on its hands yet is still trying to cook the books. Of course, neither the Navy nor EPA revealed any of this. There are still more shoes to drop and we intend to make Hunters Point the poster child for meaningful Superfund reform. On July 16, 1979, the worst accidental release of radioactive waste in U.S. history happened at the Church Rock uranium mine and mill site. While the Three Mile Island accident (that same year) is well known, the enormous radioactive spill in New Mexico has been kept quiet. It is the U.S. nuclear accident that almost no one knows about. Just 14 weeks after the Three Mile Island reactor accident, and 34 years to the day after the Trinity atomic test, the small community of Church Rock, New Mexico became the scene of another nuclear tragedy. Ninety million gallons of liquid radioactive waste, and eleven hundred tons of solid mill wastes, burst through a broken dam wall at the Church Rock uranium mill facility, creating a flood of deadly effluents that permanently contaminated the Puerco River. No one knows exactly how much radioactivity was released into the air during the Three Mile Island accident. The site monitors were shut down after their measurements of radioactive releases went off the scale. But the American public knows even less about the Church Rock spill and, five weeks after it occurred, the mine and mill operator, United Nuclear Corporation (UNC), was back in business as if nothing had happened. Today, the Church Rock accident is acknowledged as likely the largest single release of radioactive contamination ever to take place in U.S. history (outside of the atomic bomb tests). Why is the Church Rock spill – that washed into gullies, contaminated fields and the animals that grazed there, and made drinking water deadly – so anonymous in the annals of our nuclear history? Perhaps the answer lies in where it took place and who it affected. Church Rock was a small farming community of Native Americans, mainly Navajo, eking out a subsistence living off the arid Southwestern land. Nearby, several hundred million gallons of liquid uranium mill tailings were sitting in a pond waiting for evaporation to leave behind solid tailings for storage. On the morning of July 16, 1979, part of the dam wall collapsed, releasing a roaring flood of radioactive water and sludge. Wednesday, March 8, 6:30 p.m. The Department of Energy (DOE) recently released a Draft Environmental Impact Statement (DEIS) for the SSFL cleanup in which every option proposed would breach the legally binding cleanup agreement it signed in 2010 to clean up all contamination at SSFL. 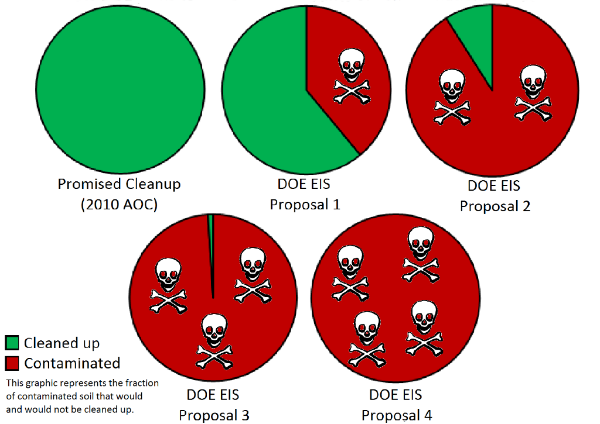 DOE now proposes instead to leave between 39% and 99% of the contamination not cleaned up. DOE hearings this week demonstrated public anger at DOE proposing to break its cleanup commitments, but much more is needed to ensure that DOE will uphold its SSFL cleanup commitments. We look forward to seeing you on March 8th for some straight talk about SSFL. PS. If you haven’t yet, please submit a comment demanding that DOE honor its commitment to clean up all contamination at SSFL, and ask your friends, family, and neighbors to do so as well.